Lockheed Martin has introduced a software-defined space technology designed to allow small satellites to alter their missions in orbit. The company said Wednesday it will integrate the SmartSat satellite architecture into its Pony Express and Linus nanosats, which are scheduled to launch in 2019 on the first LM 50 nanosatellite bus. 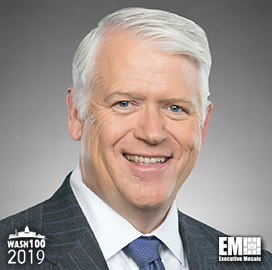 "SmartSat is a major step forward in our journey to completely transform the way we design, build and deliver satellites," said Rick Ambrose, executive vice president of Lockheed’s space business and a 2019 Wash100 winner. Ambrose noted that SmartSat aims to provide clients flexibility and resiliency to meet their evolving mission requirements and greater processing power in space. SmartSat uses a radiation-hardened computer made by the National Science Foundation's center for space, high-performance and resilient computing and a hypervisor meant to containerize virtual machines, facilitate on-board data processing in orbit and maximize memory. The software-defined technology also works to allow satellites to autonomously detect and counter cyber threats and update on-board cyber defenses against new vulnerabilities.